Initial European archeological activity in Egypt was largely a land-grab in which westerners armed with licenses from the Egyptian government carried off whatever discoveries they could lay their hands on. Items not dispersed in this way were often given away by Egypt's rulers to foreign dignitaries. 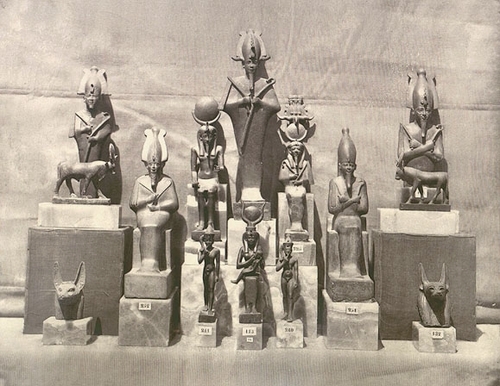 This process finally met with change in the form of the quasi-expatriate Frenchman Auguste Mariette, who in the 1850s became director of the Antiquities Service for the Egyptian government and founded the Musée Boulaq as a locus for retaining the material produced by his numerous digs throughout Egypt, later to evolve into the Cairo Museum. In 1871-2 this burgeoning collection was documented by the photographers Hippolyte Délié and Emile Béchard in a series of photographs, published with an overview by Mariette as the Album du Musée Boulaq. These inspired prints, largely taken in the crisp direct light of the Egyptian sun, are among the first photographs ever taken of their recently-unearthed objects.